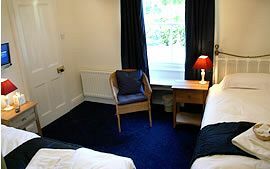 Modernised relaxing comfortable rooms with en-suites. 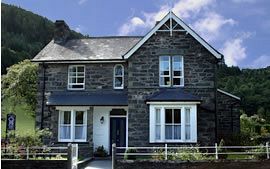 Bod Gywnedd is a Victorian stone house, recently modernised, set in the heart of the Snowdonia National Park, offering relaxing comfortable rooms with a welcoming homely atmosphere. Nestling on the fringe of Betws-y-Coed, alongside the banks of the River Llugwy and surrounded by mountains and forests, Bod Gywnedd is a special place to enjoy a restful mini-break, or base from which to experience all that is on offer within the Snowdonia National Park. Each bedroom at Bod Gwynedd is tastefully decorated and offers you a warm, cosy retreat at the end of the day. Each double has a king size bed and well proportioned private en-suite facilities with fantastic Grohe showers. You can also enjoy TV with selected sky channels and complimentary tea and coffee facilities. A hairdryer is available in each room. Breakfasts are freshly cooked to order on our traditional cast iron range, with ample choice for vegetarians. 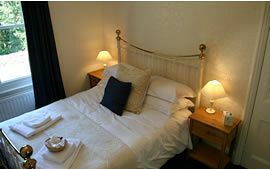 £30.00 / £35.00 per person per night. Check in times are after 4.00pm and check out at 10.00am. Special Diets Provision: Special diets are catered for. Please contact for any special dietary needs. "Have expressed our thanks to the tourist board for directing us to you. 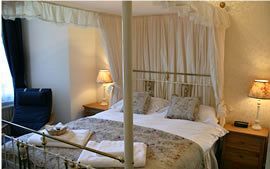 Excellent B&B, great hospitality - our sincere thanks." Robert and Ruth, Leicestershire. "Keep up the good work. Very comfortable and welcoming, will recommend!! Five Star rating." Naomi and Colin, Wiltshire. "Fantastic. Some of the best 'care' and gentle helpfulness we have ever had in a B&B. Excellent" Darren and Karen, Tattenhall. "Absolutely fantastic. The best B&B accomodation I've stayed in. Unfortunately I'll be keeping this little gem for our use. Thanks." Andy and Kate, Tunstall. Having entered Betws-y-Coed having travelled in on the A5 or the A470, pass through the village over the Waterloo Bridge. The Waterloo and Royal Oak hotels can be seen on your left hand side, then pass the Red Dragon (Old Cross Keys) restaurant on your left and we can be found 300 yds after on the left hand side.